Annerie du Plessis from the Go Purple Foundation, a non-governmental organisation, and Dr Elmien Truter, a social worker, lecturer and researcher at the Social Work Department of the North-West University’s (NWU’s) campus in Vanderbijlpark, recently presented a training session to empower volunteers and members of the SAPS to deal with child abuse. How do you know if a child is being abused? What do you do if you suspect that a child is in danger? These questions were discussed and answers were given in accordance to the Children’s Act (38/2005) and social guidelines. Article 28 of the Constitution was cited to point out exactly what it means to be a caregiver, what the constitutional rights of a child are and what a person’s responsibilities as parent, grandparent or foster parent are. Article 150 of the Children’s Act (38/2005) was also discussed to understand when a child needs care, to help role players understand what a healthy child looks like and how he or she is supposed to be cared for, as well as how to know when something is wrong. An example of a child covered in a lot of bruises were given. While lots of bruises may not necessarily indicate that a child is being physically abused, bruises varying in shades (which indicates older and more recent incidents over a period of time) could indicate abuse. What if I file a report and nothing is wrong? It was explained to the volunteers why (according to Article 110 of the Children’s Act, 38/2005 and according to the Amended Act of Criminal Law - sexual misconduct and related matters, 32/2007), it is imperative to report any suspicion of abuse. Besides the potential danger to a defenceless child, there is also the possibility of a fine and imprisonment if such information is kept from the police or social workers. The volunteers were also trained to complete Form 22 correctly – the official form of the Department of Social Development that must be completed to report suspected child abuse. It can be completed anonymously, and someone cannot be prosecuted by law for reporting abuse if the report was made in good faith and with reasonable suspicion and conviction. The form is available from NG Welsyn, FAMSA, RATA Social Services, Child Welfare South Africa as well as from the Department of Social Development. Any incident or suspicion of child abuse can also be reported at any one of these offices. The second part of the workshop were only attended by member of die SAPS, since during an emergency a child can only be removed from a situation of danger by a police officer or by a statutory designated social worker. This part of the workshop dealt with the practical implications of such a task: what to say to the child, what to do if a child is crying or physically opposing the officer. In this case it is important that the SAPS member has already arranged a place of safety for the child. A good relationship with a social worker can facilitate this process by means of contact with suitable places of safety and by the place of safety screening report. The necessity of Form 36 was illustrated with a case study. Any mistakes on this form can influence the court case, and could lead to the child being returned to an unsafe environment due to a technicality. Dr Truter’s research specifically investigates the resilience of statutory designated social workers who run a high risk of burnout, due to the stress factors associated with the job. Photo: The NWU and the Go Purple Foundation recently presented a training session during which volunteers and members of the SAPS were empowered to deal with child abuse. 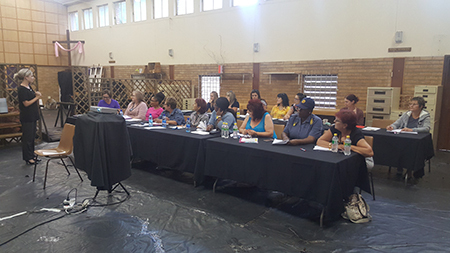 The NWU and the Go Purple Foundation recently presented a training session during which volunteers and members of the SAPS were empowered to deal with child abuse.